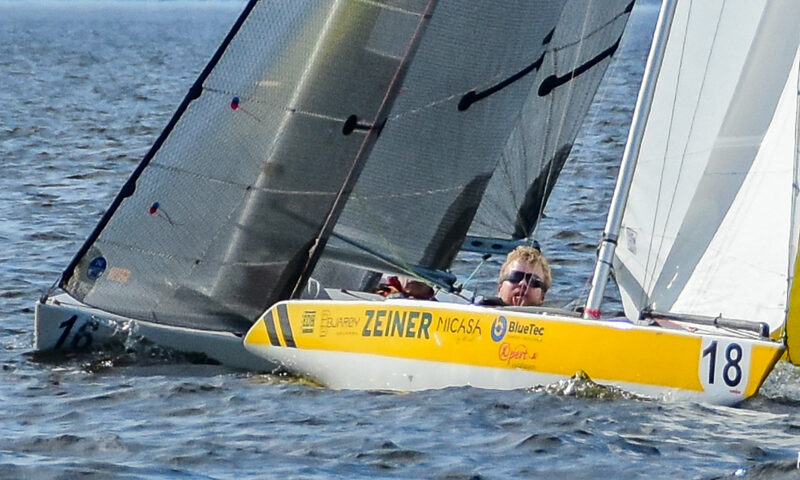 Port Charlotte, Fla. (January 29, 2019) – Sixteen competitors took to the waters of Charlotte Harbor over the weekend of January 25-27 for the 2019 Edge Sailing Midwinters — event three in the five-event 2.4 Meter Can Am Championship series. Unlike the previous two events, which each saw four competitors rack up first-place finishes in the 20-strong fleet, the leaderboard for the Edge Sailing Midwinters was dominated by two veteran racers: 2015 2.4mR North American Champion Bruce Millar, of Victoria, British Columbia, and 2018 2.4mR North American Champion Dee Smith of Annapolis, Maryland. In the first race, Millar picked up a 17-point penalty after confusion at a mark rounding resulted in his being disqualified from that race. However, he rebounded quickly by winning the subsequent two races and placing second in the final race of the day. Smith, meanwhile, finished 1-2-2-1 in those races, to finish the day at the top of the leaderboard with six points to Millar’s 21. Pocklington’s scoreline for the regatta, 4-6--4-4-2, placed him third overall with 20 points. The close competition included a photo finish, also in that last race, for Tim Ripley, of Randolph, N.J., and Charlie Rosenfield of Woodstock, Conn., who crossed the line, respectively, third and fourth. Rosenfield took fourth overall in the standings with 22 points, while Peter Eagar of Toronto, Canada, took fifth with 24 points.